Ok well my attempt at an exotic (aka, french) beakfast was a bust. Not a complete bust, but a bust nonetheless. I shall explain. Let me start with the one positive thing about this meal. The crepes themselves turned out quite good. I'm guessing the batter was the right consistency because they didn't break during cooking. And they smell quite lovely while they're cooking. It doesn't smell like pancakes. It's hard to explain. Like a cross between fried chicken and donuts. That's the best I can do. It's a mild sweetness paired with a subtle smell of melted butter. And OMIGOD is there butter. I cook almost exclusively with butter. If you're gonna go for it, best to go all the way. 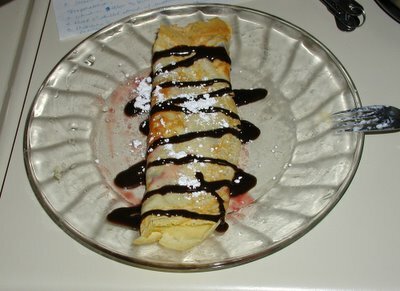 The crepes did turn out a bit greasy for my conscience, but the belly was all for it. Looks better than it tasted. I doubt I'll be trying crepes again anytime soon (unless I find myself at an authentic creperie or I find a recipe boasting itself as the best crepe filling ever comes into my possession). They're a fun cross-cultural breakfast, but just not satisfying enough for the tastebuds. Perhaps there was too much hype going into this. If you're familar with crepes and have some input to share, please do. I'd love to hear it. As for the crepe batter recipe I used the basic crepe recipe at about.com. Next week, I'm trying scones, which I have higher hopes for because they're baked (more of my forte) and they hail from the British Isles, with whom I have a closer cultural relationship with than France. Here are the buttons I bought this week. Aren't they purdy? The black lace ones are going on the SIL's MJ slippers. The rest are gettin' stashed. Au Revoir! LOVE the celtic knot ones. 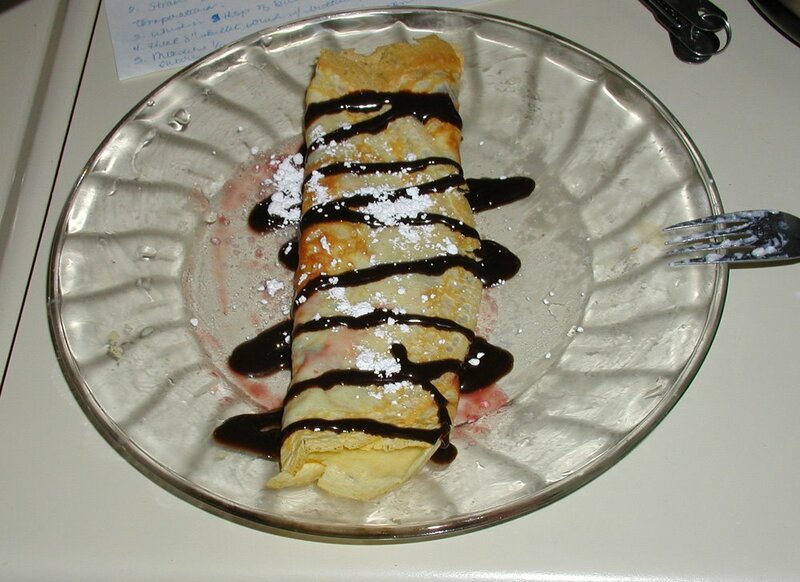 When I made crepes, they were coconut flavored, and I filled them with fruit and ice cream. I thought they were pretty good, the ones that turned out well that is! Sorry about your crepe disaster. I've never really liked crepes myself, even when they're made right! I love, love, love those celtic knot buttons! It must be the irish in me! One of my friends made crepes from an online recipe once and they came out overly greasy. They still tasted good, but were like...GLISTENING. 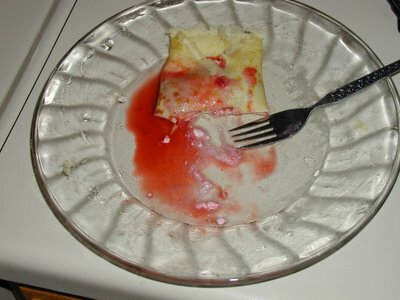 I'm not a huge fan of crepes, but blintzes are TOTALLY MY THING. HOOYA! And pancakes, of course. I give you credit for even trying to make those darn things! I say plug in the toaster and open a box of Pop-Tarts!